Function meets fashion in our stylish ID lanyard collection! Now you no longer have to sacrifice your chic and professional style with a traditional nylon lanyard. 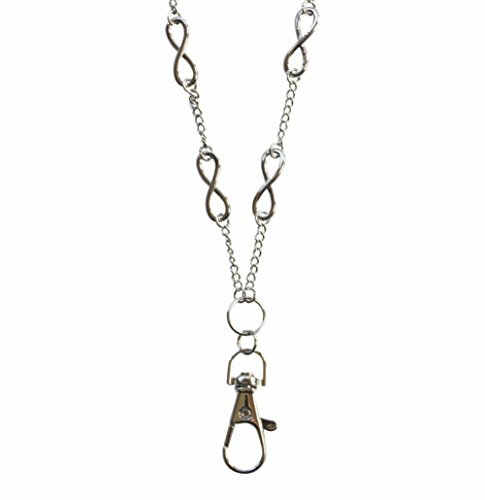 Add a stunning fashion lanyard to accent you look! Don't be fooled by these pretty faces though - these lanyards are here to work! Durable and strong, these high function pieces will do the job and do it in style! Each piece comes with a clip for your badge as well as a very functional split key ring. Hannah: The beautiful infinity loop symbolizes, eternity empowerment and everlasting love. Now you can show your empowerment with this versatile and stunning silver lanyard. Sure to become your favorite "go to" accessory! If you have any questions about this product by Sweet Carolina K, contact us by completing and submitting the form below. If you are looking for a specif part number, please include it with your message.